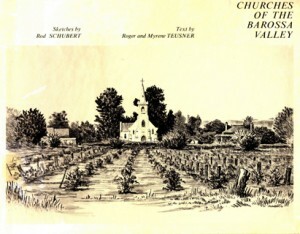 Profusely illustrated with sketches throughout the text, this book features the forty-two churches of the Barossa Valley in South Australia. In some instances the history of these congregations dates back to the earliest settlements with the various religious denominations represented in most of the major towns. It intrigues visitors to find that there are often several Lutheran churches in close proximity, as at Tanunda where there are four Lutheran churches, and a total of six churches within a short distance of the post office. This can be explained by the fact that in the early history of Lutheranism in the Valley a number of divisions occurred, with the result that several different Synods were established. Each had its own churches. It was only in 1966 that a final union was brought about, whereby one Lutheran Synod was formed. Meanwhile 25 Lutheran Churches had sprung up in the Valley. Of particular interest to Wends is the St. John’s Ebenezer Lutheran Church. The beginnings of Ebenezer date back to 1851 with the departure from Hamburg in Germany of emigrants for South Australia. On board the ship Helene were 150-160 passengers, 98 of whom were Wends from Saxony. Upon their arrival on Christmas Eve in 1851, most of these Wends went to Rosenthal (Rosedale), moving north to Ebenezer in the New Year. Their earliest services, including baptisms, took place firstly in a private home and then in a church school, erected in 1858. In 1859 the first Ebenezer church was built. This building was used for 46 years until the constant need for repairs necessitated the building of a new church in 1905. The small pipe organ, built in 1875, was still being used at the time of publication of this book, and is one of the few remaining organs built by Daniel Heinrich Lemke, the renowned Barossa Valley organ builder, who had emigrated from Posen in 1855.